Details about New Behringer KM750 Professional 750W Stereo Power Amplifier Best Offer! New Behringer KM750 Professional 750W Stereo Power Amplifier Best Offer! Outstanding E-Bayer, super fast shipping! 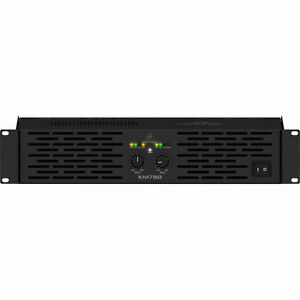 Km 750 amp is an awesome amplifier, very strong, detailed, good headroom. The fans are not noisy while playing like some say. The sound quality is as good as amps that cost 3 time$ . you must feed it a clean signal and have high quality speakers.. I use it for home application with cd , mp3 and phone apps. It sounds very good. Great value but noisy Fan for home use. Quality sound straightforward & powerfull, runs 2 pair of Towers easily. A great bargain for the right application.